Carotid ultrasound is a pain-free, simple and safe test that uses high-frequency sound waves so your doctor can evaluate the condition of your carotid arteries. This test shows whether plaque is present in your carotid arteries and generally takes about 30 minutes to complete. Patients do not need to fast for this test. Photo courtesy of National Heart, Blood and Lung Institute. Figure A shows where the right carotid artery is located in the head and neck. Figure B is of a normal carotid artery. Figure C shows what it looks like with reduced blood flow and plaque buildup. If plaque develops in the body’s arteries, this is called atherosclerosis. With time, plaque narrows and hardens the arteries. This can limit blood flow to your organs and other parts of your body. Atherosclerosis can cause a heart attack if plaque builds up in the coronary arteries, and can cause a stroke if it accumulates in the carotid arteries. If atherosclerosis is present in the carotid arteries, this is called carotid artery disease. Blood clots can also form if the plaque in an artery cracks or ruptures. Blood platelets can adhere to the site of the injury and may cluster to form blood clots, which can partly or fully block a carotid artery. 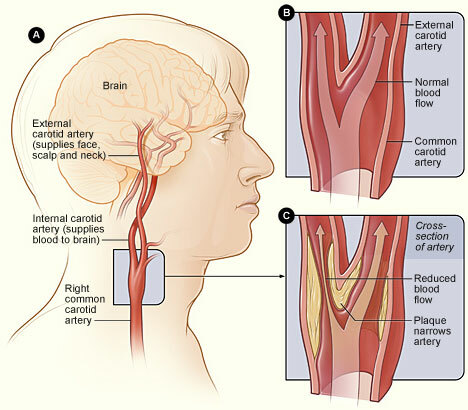 If a fragment of plaque or a blood clot breaks away from the wall of the carotid artery, it can travel through the bloodstream and lodge in one of the brain’s smaller arteries. This can obstruct blood flow in the artery and cause a stroke. The problem with atherosclerosis is its presence may not cause signs or symptoms until the carotid arteries are severely narrowed or blocked, unfortunately after a first stroke has already taken place. Carotid artery disease causes more than fifty percent of the strokes that occur in the United States. You have the best chance for full recovery if treatment to open a blocked artery is given within 4 hours of the start of symptoms. The quicker treatment takes place, the better your chances of recovery. Lifestyle changes, medical procedures and prescription medications can help prevent or treat carotid artery disease and may reduce the risk of stroke. Call 911 immediately if you have symptoms of a stroke such as: sudden numbness or weakness on one side of the body; double or blurred vision in one eye; sudden dizziness or falling; or an inability to talk. Do NOT drive yourself to the hospital. What can I expect during the carotid ultrasound test? You will lie on your back on an exam table for the test. Your technician will put gel on your neck where your carotid arteries are located and use a hand-held device called a transducer that can send and receive ultrasound waves that measures their echoes as they rebound off the artery walls and blood cells. The computer uses these echoes to create and record images of the insides of the carotid arteries which are displayed for Dr. Fenster to review. Where will the carotid ultrasound test be performed? If you are unable to keep the appointment, please contact us at the phone number above at least 24 hours prior to your scheduled time.